Luderitz has a long and illustrious history dating back to 1488 when Bartolomeu Diaz erected a stone cross here, similar to one you can see now at Diaz Point. Some architectural highlights of this town include the railway station, designed by Metje & Ziegler; Goerke House, the most beautiful home in town; and Troost House, built in typical colonial style. Or take a cruise on Redford Bay to view the penguins. 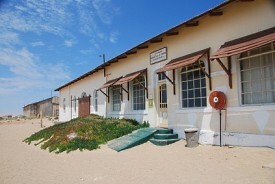 One of the most interesting attractions in Luderitz is Kolmanskop, an old diamond-miners ghost town.